Mumbai Indians and Royal Challengers go head to head once again in IPL 2019. This time the battle will take place in the home of Mumbai – Wankhede Stadium, which will be the 31st game of the season. 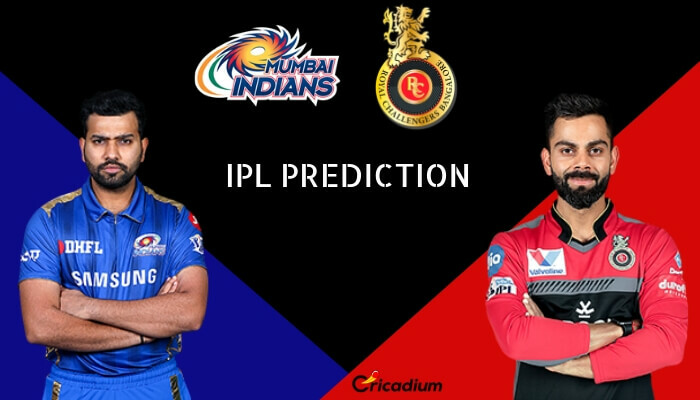 Keep reading to find out the IPL 2019 Match 31 MI vs RCB Match Prediction. When these two teams last met at the Chinnaswamy, Mumbai had defeated the hosts by 6 runs. Batting first, MI scored 187/8 but RCB fell short by 6 runs despite an unbeaten 70 by AB de Villiers. That game wasn’t short of controversies. The umpire failed to spot the no-ball of the last ball of the chase. Lasith Malinga had overstepped but unfortunately for RCB, the game didn’t end in their favor. MI has won 4 games out of 7 so far. On the other hand, RCB won the first game of the season after losing 6 on the trot. But the road ahead is tough for Virat Kohli & Co. as the 3-time champions are pretty strong at home. IPL 2019 MI vs RCB Match Prediction: MI lost the last game against Rajasthan Royals due to poor bowling. However, they would be expected to get their act together and perform better against RCB.